Game of Thrones Dragonstone Gate Bookends | Nerd Much? Have you ever wanted to get home and be greeted by real dragons? 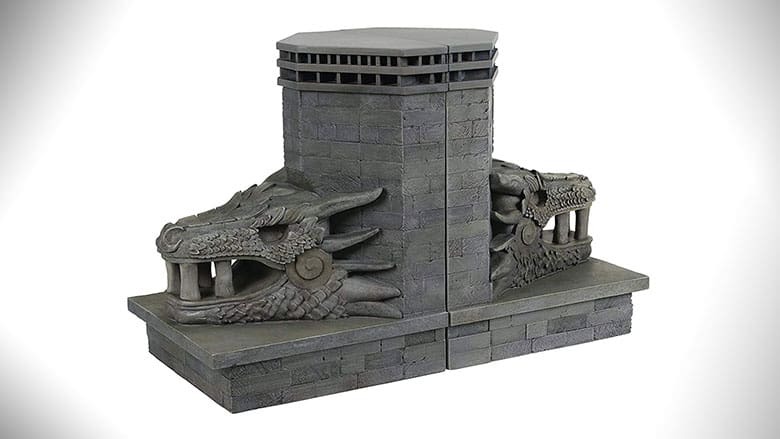 Well, unfortunately, we don’t have real dragons, that’s a PR nightmare, but we do have the next best thing: Game of Thrones Dragonstone Gate Bookends. These Dragonstone Gate Bookends are perfect for holding your massive collection of Game of Thrones Blu-Ray/DVDs, and I suppose they could hold your Song of Ice and Fire books if you’re into the reading thing. These Dragonstone Gate Bookends are officially-licensed Game of Thrones merch that resembles the Dragonstone Gate from the amazing HBO show. These are quality products that Khaleesi herself would endorse. They are exact replicas of the gates from Dragonstone, hand-painted in a grey tone with exceptional care and detail. They are made from polyresin, although, there is the rumor they are actually the scales of the deceased Viserion. They stand at 7 & ½” tall and 6” wide, meaning they are exactly 1:140 the size of Daenerys’ dragons. These bookends are big and sturdy enough to give Hodor a run for his money when it comes to holding things. Discover for yourself the power of these Dragonstone Gate Bookends that add a nice atmosphere to any shelf or windowsill that’s sure to impress even your nerdiest friends. You can buy them for yourself or that Game of Thrones fanatic that every group has. They are imported by dragons (or FedEx, whatever) and require no assembly. However, it is best to keep them out of the reach of children under the age of 14. The attention to detail and the care taken in hand painting these bookends makes them a bargain for any avid Game of Thrones fan, and they’re useful with or without books.